You do not have to have a PayPal account to use a debit or credit card. Set Quantity for tickets after clicking the Pay Now button. 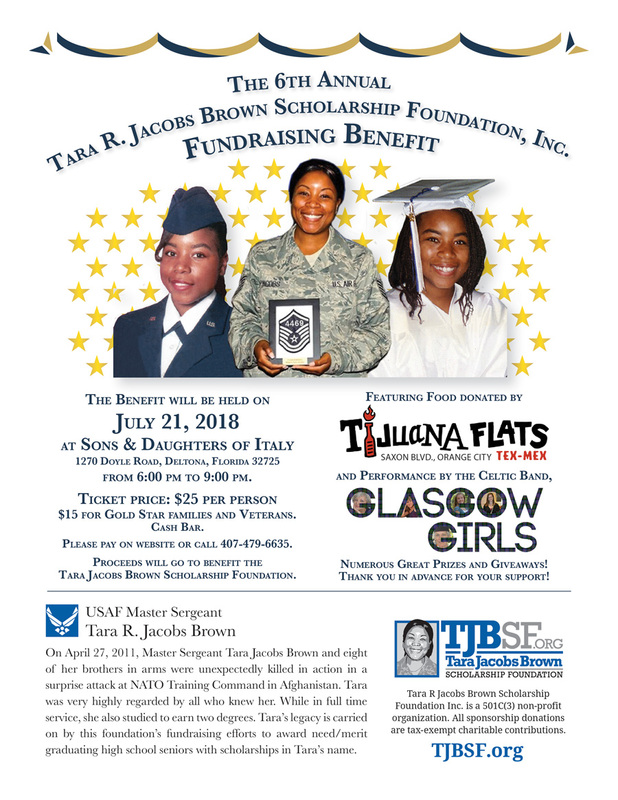 Tara R. Jacobs Brown Scholarship Foundation, Inc. The Benefit will be held on July 21, 2018 at Sons & Daughters of Italy 1270 Doyle Road, Deltona, Florida 32725 from 6:00 pm to 9:00 pm. Ticket price: $25 per person $15 for Gold Star families and Veterans. Cash Bar. Please pay on website or call 407-479-6635. Proceeds will go to benefit the Tara Jacobs Brown Scholarship Foundation. Featuring Food donated by Tijuana Flats Tex-Mex (Orange City) and performance by the Celtic Band, GLASGOW GIRLS. Numerous Great Prizes and Giveaways! Thank you in advance for your support! On April 27, 2011, Master Sergeant Tara Jacobs Brown and eight of her brothers in arms were unexpectedly killed in action in a surprise attack at NATO Training Command in Afghanistan. Tara was very highly regarded by all who knew her. While in full time service, she also studied to earn two degrees. Tara’s legacy is carried on by this foundation’s fundraising efforts to award need/merit graduating high school seniors with scholarships in Tara’s name. Tara R Jacobs Brown Scholarship Foundation Inc. is a 501C(3) non-profit organization. All sponsorship donations are tax-exempt charitable contributions.